Major foodservice distributor integrates Shipping Solutions with their ERP system. Performance Food Group wanted a faster, more accurate way to create export documents by eliminating the need to re-type information available in their ERP system. 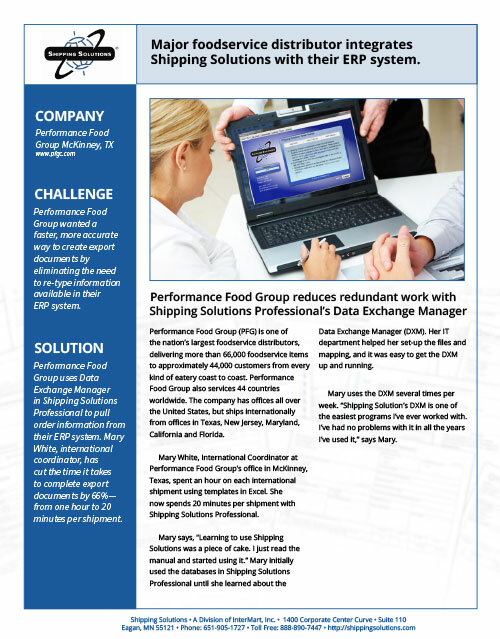 Performance Food Group uses the Data Exchange Manager in Shipping Solutions Professional to pull order information from their ERP system. Mary White, international coordinator, has cut the time it takes to complete export documents by 66%— from one hour to 20 minutes per shipment. Performance Food Group (PFG) is one of the nation’s largest foodservice distributors, delivering more than 66,000 foodservice items to approximately 44,000 customers from every kind of eatery coast to coast. Performance Food Group also services 44 countries worldwide. The company has offices all over the United States, but ships internationally from offices in Texas, New Jersey, Maryland, California and Florida. Mary White, International Coordinator at Performance Food Group’s office in McKinney, Texas, spent an hour on each international shipment using templates in Excel. She now spends 20 minutes per shipment with Shipping Solutions Professional. Mary says, “Learning to use Shipping Solutions was a piece of cake. I just read the manual and started using it.” Mary initially used the databases in Shipping Solutions Professional until she learned about the Data Exchange Manager (DXM). Her IT department helped her set-up the files and mapping, and it was easy to get the DXM up and running. Mary uses the DXM several times per week. “Shipping Solutions’ DXM is one of the easiest programs I’ve ever worked with. I’ve had no problems with it in all the years I’ve used it,” says Mary.